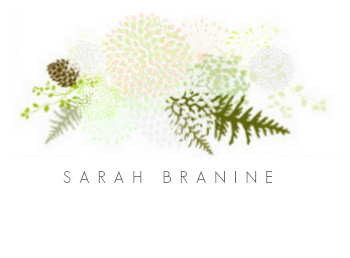 sarahkatebranine: a resurrection of sorts + remarketing . a resurrection of sorts + remarketing . My little Etsy shop has been busy lately and I am so thankful. Although it can feel like running a marathon at times, I am very grateful for Cranny. Okay, I have never run a marathon, so maybe I should use a different comparison. Here we go: sometimes it can feel like life with a whiny toddler when nap-time is still hours away. Do you know what I mean? Then, when nap-time arrives and you lay the little one down, and minutes later you think, boy, I love that baby!. All of the whininess is ( almost! ) forgotten and you recall the sweet moments of the morning instead. Cranny is much the same for me. I forget the late nights and failed projects and recall the good character traits about owning my own Etsy shop. 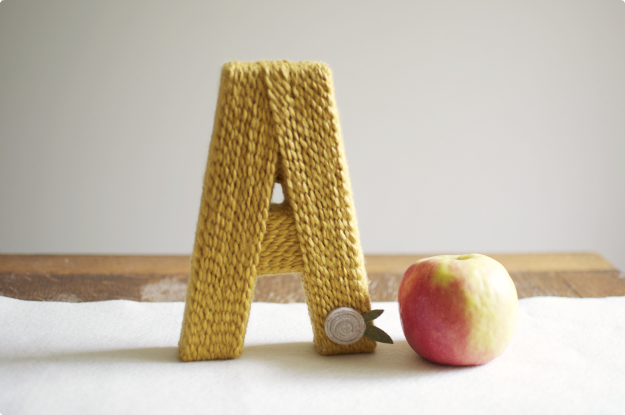 Over the last weeks, I've had several yarn letter orders trickle through my shop. For me, it's difficult to find the time to spend on updating my shop, so I was extra excited to accomplish new stock photographs this week. That said, completing several new yarn letter orders got me thinking about a past project and also about the future concerning these letters. Over the last year, I've found myself drawn more and more towards promoting these letters for children and babies rather than adults. I especially found it more enjoyable to photograph them for use in nurseries and children's rooms. When I first began making the yarn letters, I was so excited about certain aspects. I loved the mustache and posie options. Now, I really don't love the look of a mustache on the letters, but I am happy to complete an order for someone who does love the look. 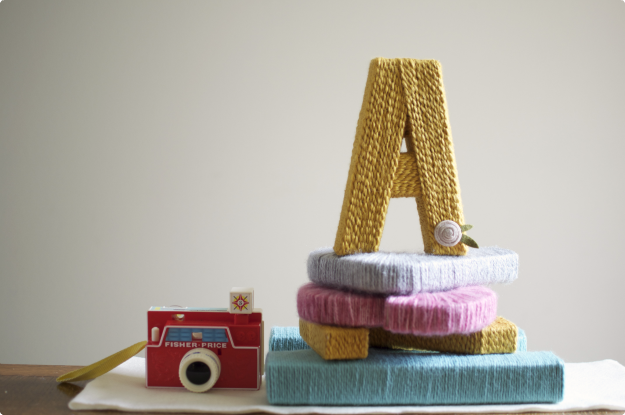 I do, however, still think a posied yarn letter is a very sweet look for a little girl's room. Okay, enough rambling. 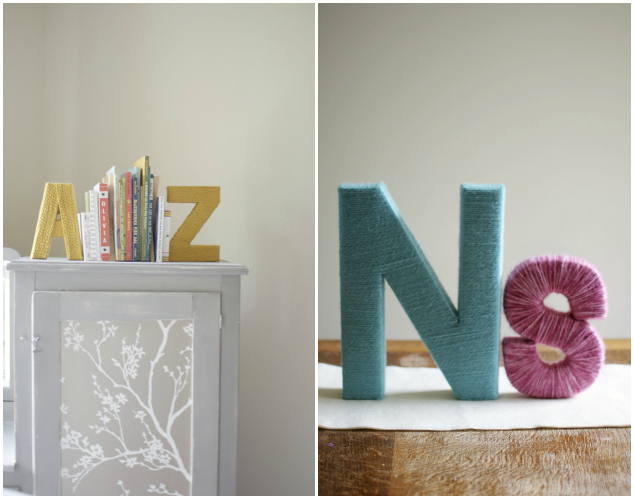 All of these recent yarn letter orders got me to thinking about my past Yarn Letter Project. Remember that? After about 6 weeks, the project came to a halt, mostly because I was so sick during the early months of Job's pregnancy and I was unable to do anything else aside from caring for my family. Read: I fell into bed at 8pm every night and there was no time for Crannying! I'd like to resurrect the Yarn Letter Project with a few changes. I probably won't be advertising a discounted letter every week, but it is probable that you'll see a yarn letter post about twice each month. If you've been wanting to purchase a yarn letter, keep an eye out for these posts! I'm excited about ( hopefully! ) finishing this project. I'm learning that finishing a project doesn't always happen in my originally imagined time-table. But I still want to finish or try to anyway! happy weekending to you and thank you for reading here . I think you're smart to drop the mustache trend. I think that one will be short-lived. ;) I love the staging of these letters, the flowers are timeless! So, no time for bon-bons and soap operas? hee. hee. Glad your shop is busy! I hope your adoption fund is growing! Beth, thank you so much! Haha! I'd love some bon-bons right about now. Guess I'll pass on the soaps, but chocolate, it is welcome anytime :) I would love to say that our adoption fund is growing, but truth be told, it is at a standstill right now. And that is okay-- I know God is totally seeing everything and will start it back up again when we need it. Cranny is supplementing our income a little bit right now and paying for things ( like staycation fun! ) that we could not otherwise afford. God is good. ohmygoodness! I just put this together-- I am going to be at the Desiring God conference in September. . . which means. . . we need to meet!!!!!! !